Austin & Ally star Laura Marano rocked the stage for this year’s final installment of the PEOPLE Now Concert Series Presented by Toyota Music! Starting out with the song “Dancing Around the Truth,” the Disney Channel star brought plenty of energy and style to the stage as her fans danced and sang along. In between performing songs for the crowd, Marano, 20, also had time to play a round of “Truth or Dance” with host Jeremy Parsons. The game revealed her not-so-secret celebrity crush on George Clooney. 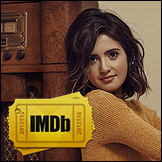 While the young singer admitted that being on Austin & Ally was a really special experience, she says that the biggest moment of her career so far was signing with Big Machine Records – the label responsible for bringing Taylor Swift into the spotlight 10 years ago. Marano then closed out her set with two songs from her debut album, slated for release later in the year. She had the crowd dancing along to “Outcast” and her first single “Boombox,” which features a surprising face in the music video – actor Ken Jeong! Marano also happily revealed that her second single, “LaLa,” will be dropping on Aug. 25.